Alright, so after a long four month wait, the wait is finally over and I finally got the chance to watch Digimon Adventure tri. 2: Ketsui. I finished all four episodes in one sitting and to be quite honest I have mixed feelings about the four episodes. Not to say it was bad, but I expected a lot more after waiting for four months to see this - plus a few other things. One of the things I disliked was the first episode of Ketsui, Toei Animation could have just kept the first one to themselves. Everyone gathering together and going to a hot spring was something I did not wait four months to watch. 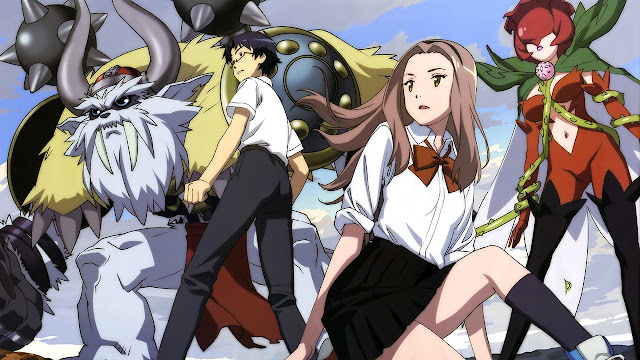 Maybe if Digimon Adventure Tri was released weekly I would have enjoyed the first episode more. However since I waited four months, they could have substituted the first episode and gone straight to the second one. On the topic of the four month wait, the other thing that drives me insane is the pacing of how these movies are being released. They're released in episode format as a bundle of four on a specific date everyone few months. Like brah, I cannot wait months at a time for a measly four episodes. Just no. And Digimon Adventure tri. 3: Kokuhaku is released on Sep 24, 2016 - which drives me insane. Why do I have to wait 6 to 7 months, I'm not getting any younger! But besides the pacing of the release dates and the first episode of Ketsui, I really enjoyed watching it. Obviously these four episodes focused more on Mimi and Jou (low-key I've always shipped these two). Mimi's storyline wasn't all that interesting to watch in comparison to Jou's. I guess they've labelled Mimi as "annoying" in Ketsui, though I've never gotten that vibe from her from either Digimon Adventurer or Digimon Adventure02. One of my favourite portions of Ketsui was I watching Jou face his inner demons. I thought it was very cathartic to watch; we finally understand why Jou was distancing himself from everyone during Saikai. And seeing that reconnection and strengthening of the bond Jou has Gomamon made me a bit emotional. Don't laugh, I'm a big Digimon fan! If you've already seen Ketsui, then you already know that the best part of the anime was the last 10 minutes of the last episode. Finally we get to see Gomamon digivolve into Ikkakumon, not even afraid to admit that got me a bit emotional again... LOL. But lord have mercy I almost fainted when watching Togomon digivolve into Lillymon. When Lillymon came out of that flower bud, I was shrieking with excited; it felt like I was a kid again. And all bets were off when Zudomon went to Vikemon and Lillymon went to Rosemon. I was mentally prepared for it but I pretty much passed out watching Rosemon and Vikemon go against Imperialdramon. Anyways that was it for this review, yea I know I did not touch upon Ken Ichijouji and Maki Himekawa who were also in Ketsui. I'd rather give my take on them after Kokuhaku is released since I feel like the story would unravel more by then. And sigh... we have to wait 6-7 more months for Kokuhaku. Why Toei Animation is doing this to me I really don't know, it's like mental torture. But thanks for reading, please wait for next week!